I have known Verónica for many years. She was my across-the-street neighbor from the time she was 16 or so to her current late 20s. Verónica is dirty, unkempt, and to the uninformed appears to be an undeterminable age much older than she really is. Her hair is a matted, tangled mess that makes Bob Marley look like someone having a good hair day. Her skin is old, street-grimy black; her feet are now the flattened wide feet of a barefoot person living on pavement, and her exposed belly could pass for that of an iguana. Her clothes are old, dirty, torn–covering little, revealing much. She is dressed in a way that exposes most of her, way too much of her, to the gawking eyes of men, the kind of low-life men for whom momentary availability is the only requirement and for whom attractiveness is an unaffordable budget-busting luxury. Verónica’s way of dressing advertises her current career choice, but abuse, overuse, and lack of maintenance have relegated her to the equivalent of a clearance bin at Walmart. Yet somehow, she generates enough business to keep herself in drugs; to keep herself stoned to the point of disengagement from normal life. “Verónica, do you know who I am? I used to live across the street from you.” The blank stare simply looked at me and said with unspoken words, “Go ahead and have me, use me, just give me something.” I urged her to get help. I offered to take her to a recovery center. When she failed to recognize me as her former neighbor and when she failed to acknowledge me as the missionary pastor that I am, and when she failed to accept my offers of help, I said “goodbye” and walked away down the sandy beach that separates the city of La Paz, Mexico from the Sea of Cortez. I was conflicted in my soul. I wanted to help, but there really was nothing I could do at that time. On my return walk along the beach I found Verónica again, but this time face down in the sand in a deep sleep, the kind of deep sleep that only a witch’s brew of drugs can induce. I checked to make sure her airway was open and then walked away. She’ll wake up in a couple of hours, stagger back to her shack across the street from where I used to live, and sleep the day away. Tonight she’ll head back to the street looking for men willing to rent her for nothing more than a small plastic bag half filled with some white powder or tiny crystals. If she eats anything at all it will only be so that she’ll find the energy to discover her next little bag of powder. Verónica may have descended to anhedonism and feels nothing, cares for nothing, and lives the life of “me es igual.” I have not made that descent to Hell. I feel all kinds of things, and right now what I feel is not pretty. I feel profound sadness, lots of it. My sadness is caused by people who, choosing not to exercise self-control, propel themselves into horrifically harmful activities with predictable, guaranteed consequences. I feel sadness mixed with revulsion at knowing what mentally depraved and physically dirty men have done to Verónica’s body and soul and what they will be doing to her again twelve hours from now. I feel sadness for Verónica as she has made and continues to make choices which confirm in her mind that she is a worthless dirty nobody, a mere plaything for a certain class of disgusting, degenerate men, and of no more worth to them than a basketball or bottle of beer, to be tossed aside after performing her limited function. I am very angry with those merchants who peddle drugs. I am sad that so many churches justifiably condemn the behavior but far too often refuse to participate in the dirty and messy process of healing and recovery; by their actions they seem to indicate their belief that one can simply teach someone out of addictions. I am upset at those churches which say “we need to preach the Gospel (Good News) in order to save the lost,” unless by Gospel they mean the Gospel preached by Jesus in which he taught truth, touched the untouchable, shared life with the rejected, slammed ritualistic religion, and invited people to journey through life with him. I applaud those groups of Jesus followers willing to dirty themselves in order to help clean the lost. I feel compassion for all those young people trapped in Verónica’s world, young people who made the wrong choices over and over again and who are now suffering greatly for having made those sinful choices. Just like a rag cleans up a mess by absorbing the filth from the object being cleaned, Jesus heals and cleans people by taking their filth from them and smearing it on himself. When Jesus cried out from the cross, “My God, my God, why have you forsaken me?” it was because at that moment he became as dirty as all the Verónicas of the world. In that moment Jesus felt the accumulated consequence of all the sin, the abuse, the treason, the immeasurable pain of a million Verónicas and he became as vile in God the Father’s eyes as Verónica. But this is still not the end of it. Jesus also took on the sin of assumed-to-be-clean, wealthy, comfortable Americans and Europeans who sin just as much as Verónica and whose sins are just as dirty and may be even more dangerous on a global scale than Verónica’s sins will ever be, but who are better able to hide their sins under a veneer of wealth. Verónica destroyed herself with her sin – of that there is no doubt. The sins of wealthy Americans and Europeans (greed, pursuit of comfort, self-indulgence, entitlement, sense of superiority, self-declared national exceptionalism, violence, incessant warfare) are destroying millions of lives. Jesus, the only sinless person to walk this earth, because of his perfect love for Verónica, you and me became, for a short time, the ugliest sin-dirtied person to ever live. God the Father did something to Jesus he never did nor ever will do to us: he turned his back on him. This story happened and was written down a long time ago. 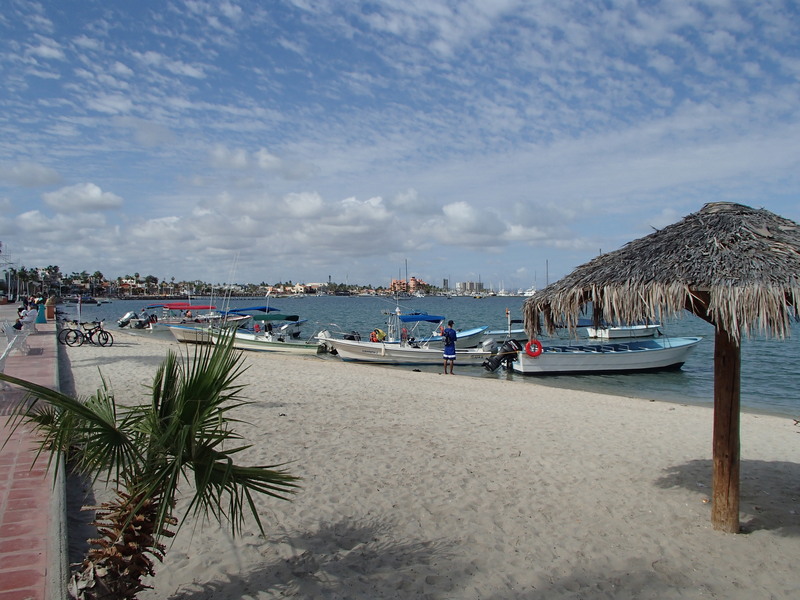 My wife and I just moved back to La Paz, Mexico, after a six-year absence. We saw Verónica yesterday, which is what caused me to unearth this story. We were surprised she was still alive; but nothing has changed. She was as dirty as always, her hair was a matted mess as always. She was dragging a bag full of cans down the street, probably to turn them in for cash in order to get her next fix. She talked to us but we couldn’t understand a word she said. Heartbreaking. Loved hearing your kind description of “Veronica” and your appropriately provocative invitation to the church to show up in these dark places. Let me know if you’re open… and what might work. We could always email, but so cumbersome relative to a real conversation. God bless you two in your ministry! Hi Carol Joy. Warm greetings from La Paz. The shack Veronica lived in with her brother burned down on Saturday morning before dawn. Everything was destroyed. Veronica has disappeared and no one knows where she is. I saw her hanging out at the bus station a couple of weeks ago. I helped her brother put up a shade tarp over his burned out property and Lois and I gave him a tool box with new hand tools to help rebuild. Sad, sad story.